Statue at the Loyola castle that depicts the wounded Ignatius being carried home. Ignatius Loyola became a soldier, and in 1521 he found himself and his small group of fellow warriors defending the fortress of Pamplona against the French. They were seriously outnumbered, and a more prudent—and less zealous—leader might have negotiated a surrender, but Ignatius was not the type to do anything halfway. They were roundly defeated by the French, and during the battle a cannonball ripped through Ignatius’s legs, leaving a mangled mess. Because Ignatius was a sort-of nobleman, and because rules of engagement back then—at least among some armies—demanded basic courtesy to other soldiers, even conquered enemies, the French carried Ignatius on a two-week journey back to his family’s castle in Basque country. So, Ignatius spent a lot of time in his head. His daydreams took him to scenes of his heroic actions that would win the heart of the lady he loved. Alternately, the stories about Christ and the saints stimulated daydreams of his becoming a great saint—greater than all the other saints, in fact! Then he began to notice that, after daydreaming about courageous acts of knighthood, he was left feeling empty and unsatisfied. But after a daydream about becoming a saint, he felt his soul lifted up. Maybe because he was stuck in bed for days on end, Ignatius paid close attention to his inner state, and he began to think that his mental and emotional reactions to these two very different kinds of daydreams were trying to tell him something. By the time he was able to walk again, Ignatius carried a new vision for his life, and he was headed in a direction quite different from before. He emerged from his months of convalescence intent on dedicating his life to God and following Christ. (left) Present-day Montserrat. It was destroyed during wars but then rebuilt on the same site, where it functions as a Benedictine abbey today. 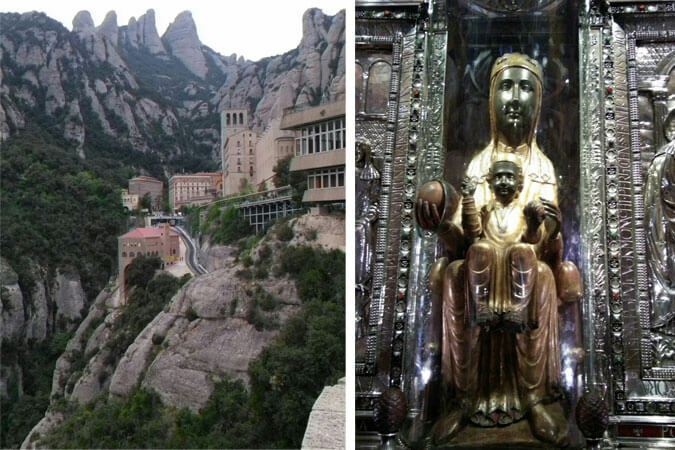 (right) Our Lady of Montserrat, which is kept in an alcove behind the altar in the basilica. Pilgrims stream through every day to pray in front of Our Lady and touch the globe in her hand. In 1522 Ignatius left the Loyola castle on a mule and made the difficult journey to the summit of Montserrat, where he laid down his sword and dagger before the sacred statue of Our Lady of Montserrat, there in the Benedictine abbey. Ignatius gave his clothes to the poor and, no longer a soldier, went looking for his new life. 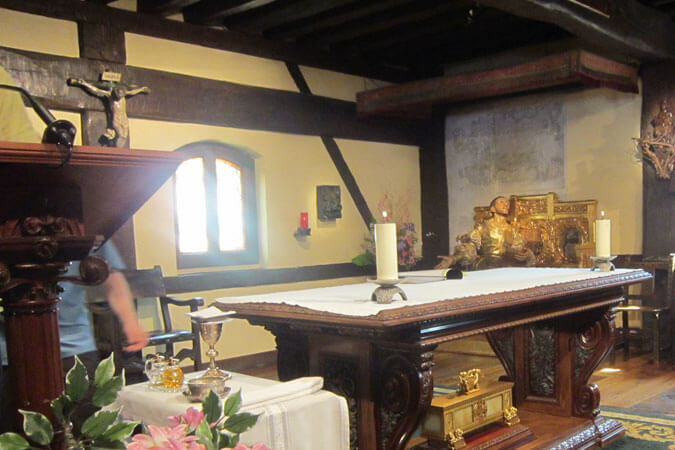 The room, inside the original castle/home, in which Ignatius recuperated from his wounds, and in which he experienced a change of heart and direction. Today this room is a chapel. I have borrowed the phrase “cannonball moment” from my colleague Tom McGrath, who used it when a group of Loyola Press employees made a pilgrimage to sites in the life of St. Ignatius. Tom told the story of Ignatius’s battle injury and the gradual conversion that followed. If it hadn’t been for that cannonball, there would be no St. Ignatius Loyola. Then Tom asked us: Have you experienced a cannonball moment—a difficult or traumatic event that shifted your life’s course? This is the question I pose today. What accident, tragedy, or hardship has rerouted your life? How did you react to that cannonball moment? In what way did this event require a change? When did you realize that God had used something difficult or painful to set you on a better course? Cannonball moments do not prove that every bad thing that happens to us is God’s will, but they do prove that God can use anything to reach us and help us. Today, Holy Spirit, bring to mind a tough memory. Thank you once again for your insightful reflection. So many Cannonball Moments during my lifetime. Once again I have to face another; this one ..Well I am older now and alone so I will need extra help from our Blessed Lord. Thank you again. A.M.D.G. Saint Ignatius is an inspiration. Nice. Thanks, Vinita Hampton Wright. Just to let you know that I am closely and prayerfully joining your weekly Ignatian pilgrimage. Makes up for my inability to join friends who can afford to travel. Thank you very much. Letty, you join a long, rich tradition of pilgrims who could not physically travel. That’s where we got the Stations of the Cross and the Christian use of the labyrinth! Much of pilgrimage is the interior journey anyway. Welcome to the trip! Thank you, Vinita, for providing the interesting background of our Ignatiian Pigrimage and for your thoughtful reflection questions. I look forward to learning more. Vinita, I always appreciate your writing and smile when I see an article posted by you. I think, “I’m in for a treat”. Would you please include your prayer? Maybe down here in the comments? I have listened to it several times and plan to pray it daily for several days to come. Thank you. Today, Holy Spirit, bring to mind a tough memory. Give me the strength to let it arise. Give me the wisdom to look at it with clear eyes. Help me feel what I felt like back then, so that I can turn that feeling into a prayer. Help me see the potential that cracked open because of this difficult time. Stimulate in me the willingness to accept this memory and count it among the wild assortment of treasures that fill my life. Amen.